This week we will discuss a common question from customers that have not used the Invisi-Tuck IWB. When I carry IWB (in-side the waistband) the holster rubs my skin raw. What can I do to help this? Carrying a handgun inside the waistband can be uncomfortable. There are so many styles of holsters and in my opinion the Invisi-TuckTM is the most comfortable style available. First as with the gun any edges that may be sharp or rough will dig in to your skin or if those edges are on the pants side they could tear the cloth. 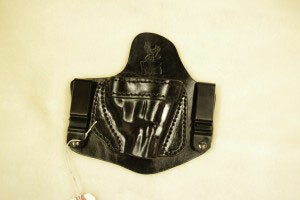 Any holster that can move in the waistband can pinch you when you sit or bend. The last thing to look at with a holster is how flat the holster is on the body side. This means if the holster is very stiff or hard molded to the gun on the skin side it means that your body will fill all of those voids and this is always uncomfortable. So the flatter the better on the skin side of the holster . The wider the holster is the more the weight of the gun will be balanced on your waist (but a wide holster that is completely rigid means it was set to someone else’ body shape; it may work for them but probably wont work for you). Please let me know if you have any other subjects you would like me to discuss in later weeks. Can you mold an IWB for a Sig p938 with trigger guard laser? While I can mold the Invisi-Tuck for almost any pistol (that I have a mold for) with a laser attached. If I do not have the same laser I may need you to send me your laser to attach to my mold. If your accessory is not listed on the order form I would suggest you call to learn the process for sending me your laser. 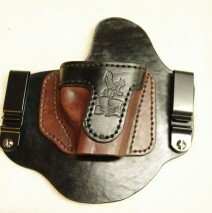 Just to confirm the belt loops on your holsters will accomodate a belt of 1-3/4″ width. Also do you have a mold for the Glock-36? Yes the Belt loops will accommodate up to 2″ belt. Yes I can mold to the Glock 36. Thank you for your question.